The dingy pulls in for a wet landing at the protected cove of Darwin Bay on an exquisite white sand beach. 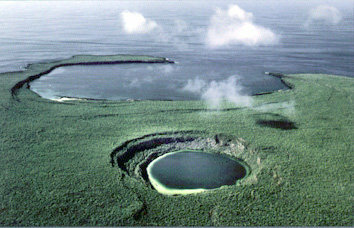 The Bay can be entered through only a narrow islet, essentially a break in the partially eroded crater of the volcano that formed the island originally. 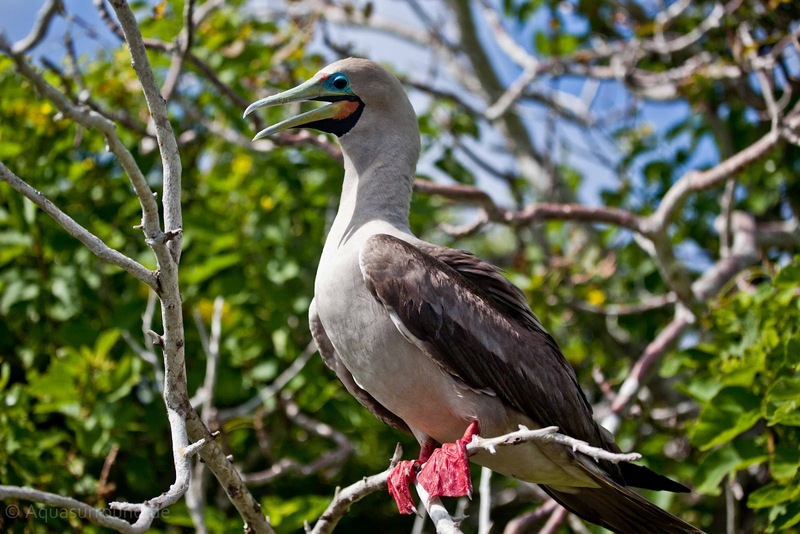 The beach is your first encounter with the variety of bird life that teems over this island. 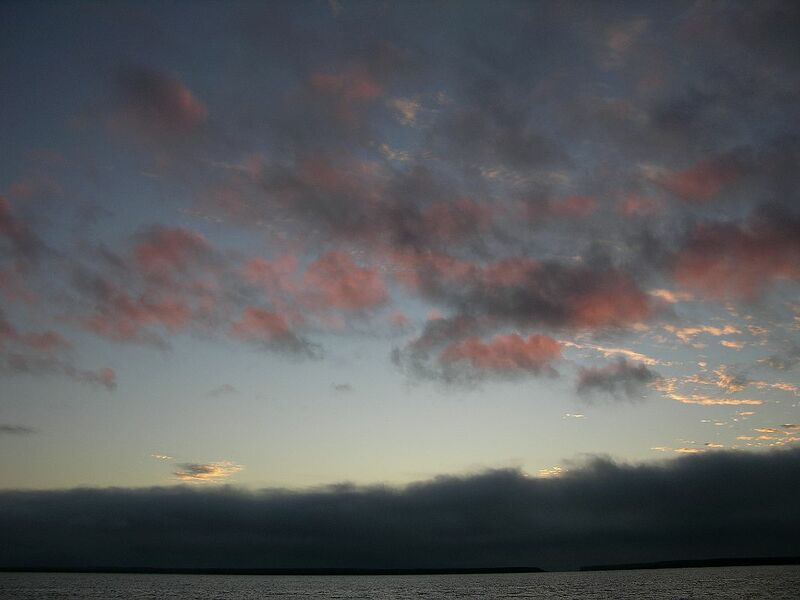 On any given morning the beach will be home to Nazca and Red-footed Boobies and colonies of Great Frigatebirds engaged in a mating dance. Directly behind the beach is a short trail through mangrove trees to inland tidal pools and outcrops of black volcanic rock and salt bushes, home to Swallow-Tailed Gulls, Lava Gulls, Lava Herons, Ruddy Turnstones, Wandering Tattlers, Whimbrels, Galapagos Doves, Galapagos Mockingbirds and Fiddler Crabs. 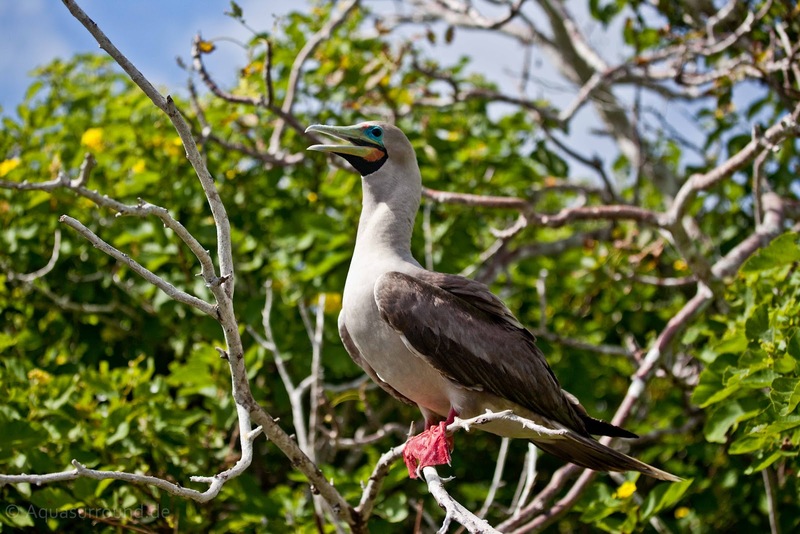 Less commonplace, but still present on Genovesa, are Yellow-Crowned and Night Herons as well as Galapagos Owls. Taken together, these birds can make quite a racket and the noise can be disconcerting if you aren’t expecting it. 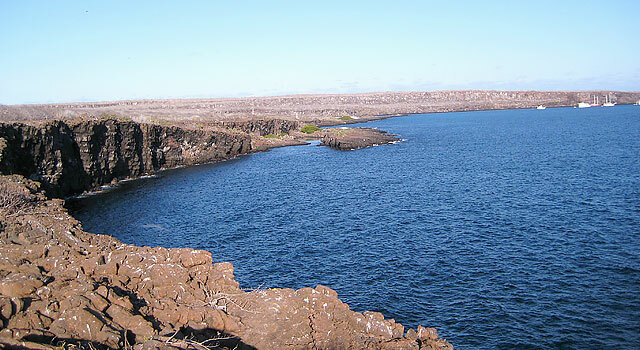 But listen carefully and soon you will hear the song that enchants this island. To experience just a taste of the bird life on Genovesa, along with me teaching about the cactus on Genovesa, look at this video taken by Cindy Procter-King, click here. 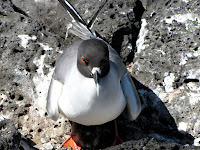 A frequently-seen resident of this island is the Swallow-tailed Gull, with eyes ringed in red. 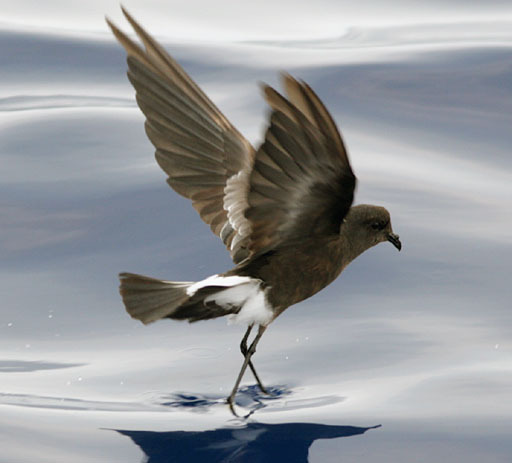 This is another pelagic bird, meaning that it spends most of its life in flight and hunting over the open ocean, rather than on land. 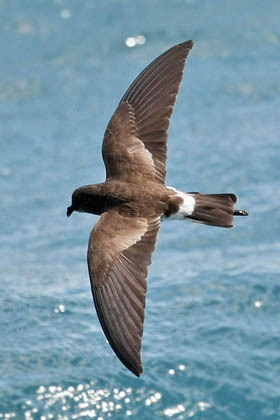 Pelagic birds typically land only for the purpose of mating, nesting and nurturing their young. 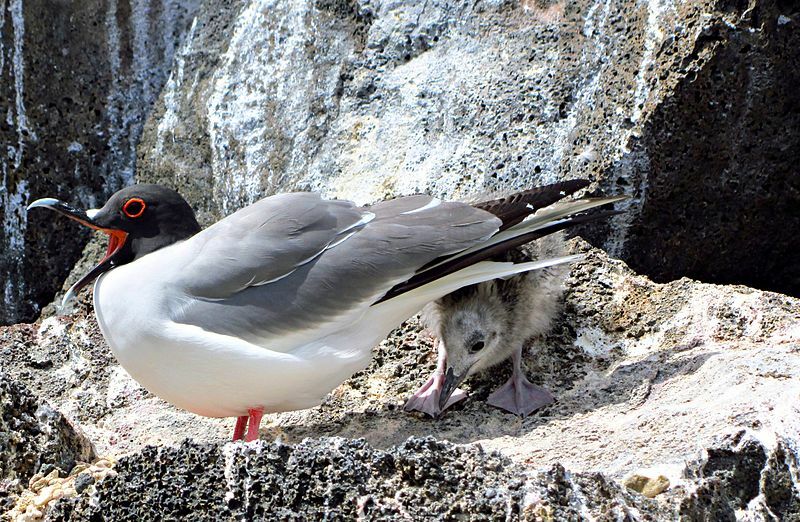 This gull is not found exclusively on Genovesa, but you likely will find it here because of its preference to breed on the rocky shores and cliffs near the warmer waters found in the eastern islands. 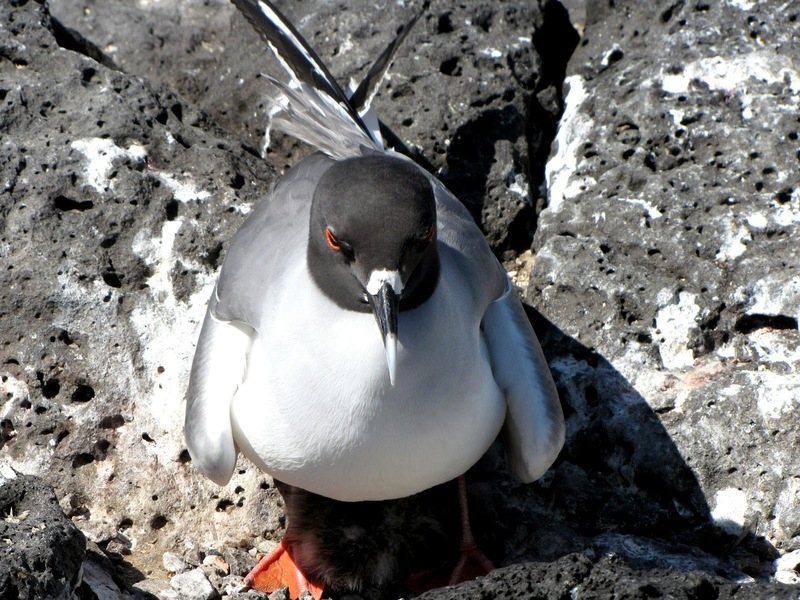 This gull is entirely nocturnal, the only one of that type in the world, and its favorite catch are the small squid and fish that rise to the ocean’s surface at night to feed on plankton. To see while hunting for food at night, the Swallow-tailed Gull's eyes are larger in size and volume than those of any other gull. Its eyes are distinguished by bright red rings circling them, believed to be another way of enhancing their night vision. 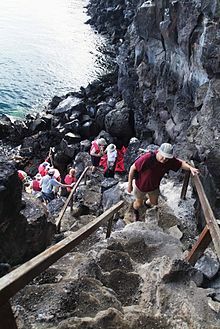 The other notable visitor site on Genovesa is El Barranca, otherwise known as Prince Philip’s Steps, located on the southern tip of the island. This is a dry landing onto a natural dock with a steep rock staircase leading to the flat top of the island. This is an extremely steep path, and the landing is somewhat challenging, but well worth the effort. The trail itself is beautiful, bird-filled and ends in a gorgeous vista. The top of the steps is the nesting site of Red-footed Boobies (by some reports there are up to 140,000 pairs on Genovesa). 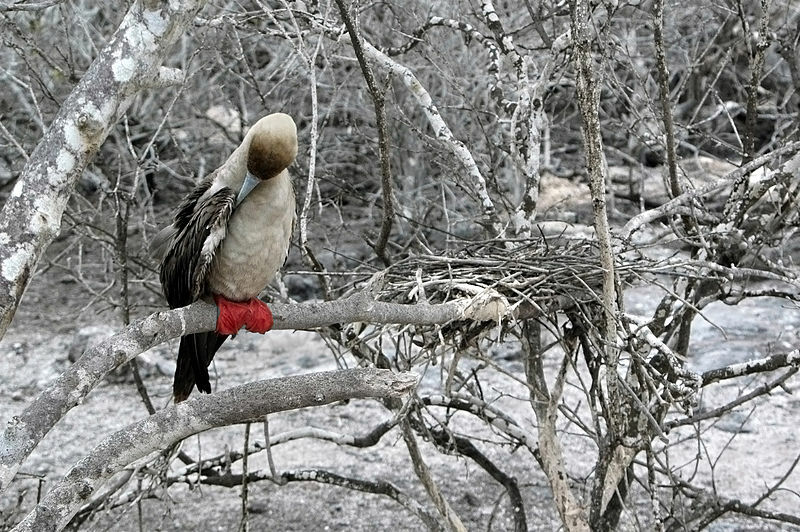 Red-footed Boobies are the only Boobies that live in trees, specifically the Polo Santo trees along the cliff line. 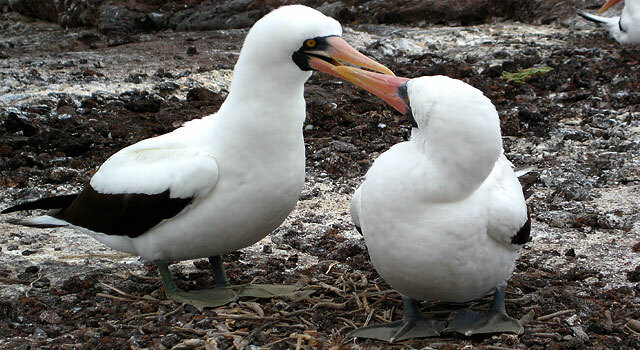 Like those of other boobies, their courtship rituals, which take place throughout the year, are comical. 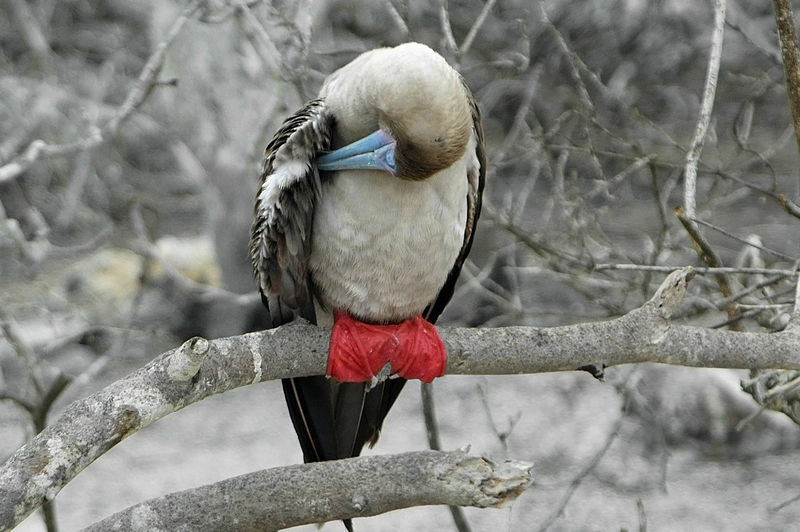 In fact, some believe that the name Boobie is derived from the Spanish word Bobo, meaning clown because of their unusual mating dance and their naivity as manifested in their landing on boats where they could easily be captured. Whatever the derivation of the name, the mating dance is a pleasure to watch and video. I’ve even had tour guests (their names will remain undisclosed) who created the most adorable Boobie dance of their own, though I don’t know if they used it for courting purposes! 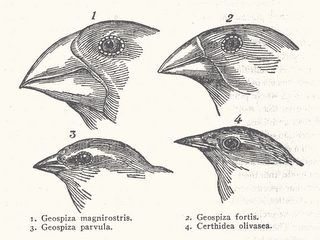 These gregarious birds live in colonies and, during mating season, hundreds may gather to pair up and mate. 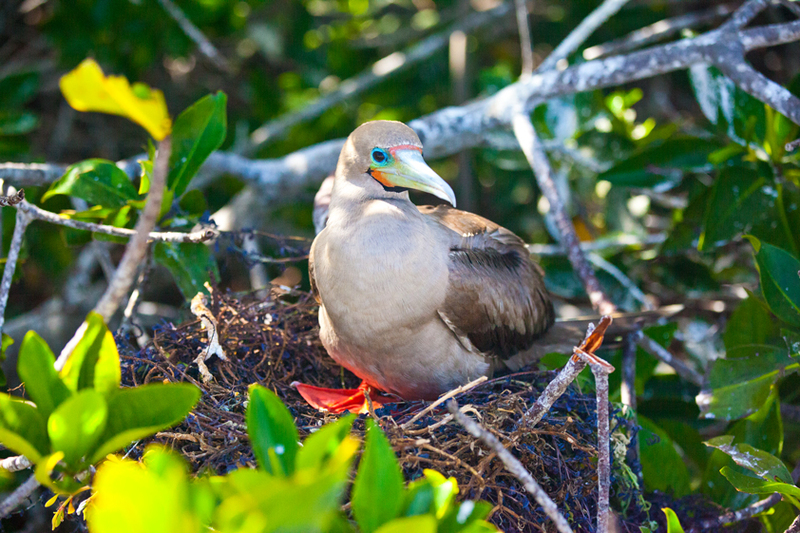 Females lay only one egg every 15 months, and both parents care for chicks. 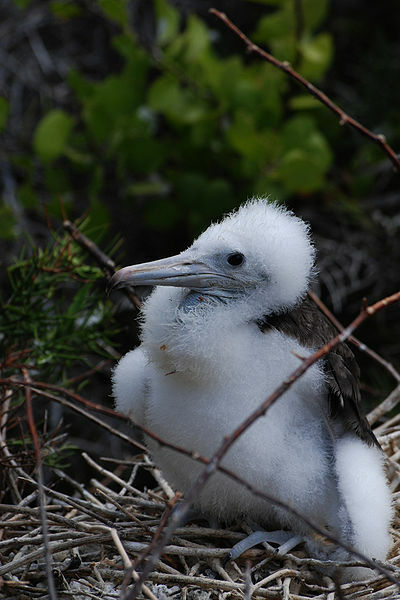 Young mature slowly, but the low reproduction rate is balanced by these birds' long lifespan—over 20 years. Only the adults, not the baby chicks, have red feet. Simply because you can NEVER see enough of these special birds here are some more photographs, all courtesy of Alex at AquaSurround of Germany. One thing I just love about these birds is how they blend and camouflage into their surroundings, except for those bright red feet. Likewise, Genovesa is the nesting site of the Great Frigatebirds; they create nests made of twigs placed as a platform in trees or tall bushes. 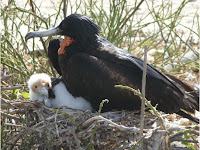 There is another species of Frigatebird in the Galapagos, called the Magnificent Frigatebird, but that species does not nest on Genovesa because they feed in shallow water and Genovesa is surrounded by deep water. 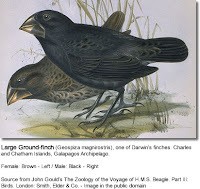 Notably, Genovesa Island is the home of four separate finch species: the Large Ground Finch, the Sharp-beaked Ground Finch, the Large Cactus Finch and the Warbler Finch. 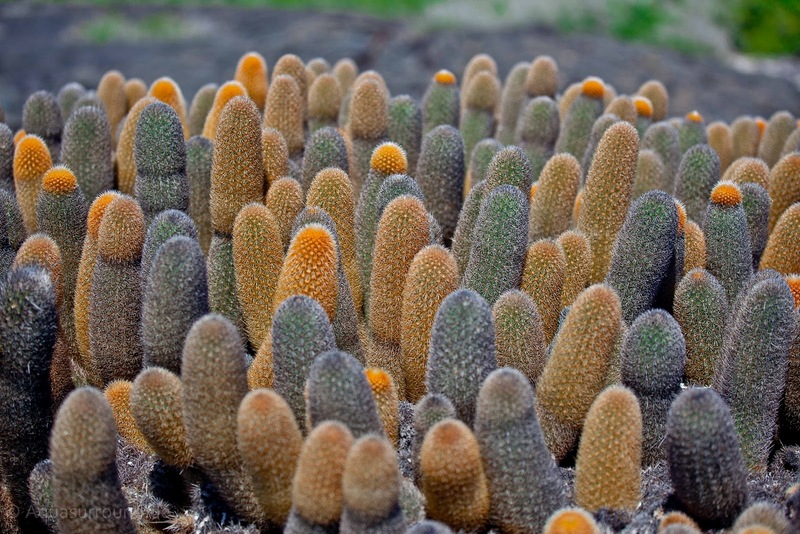 All species have been extensively studied; an abstract of one study is available for anyone interested in learning more. 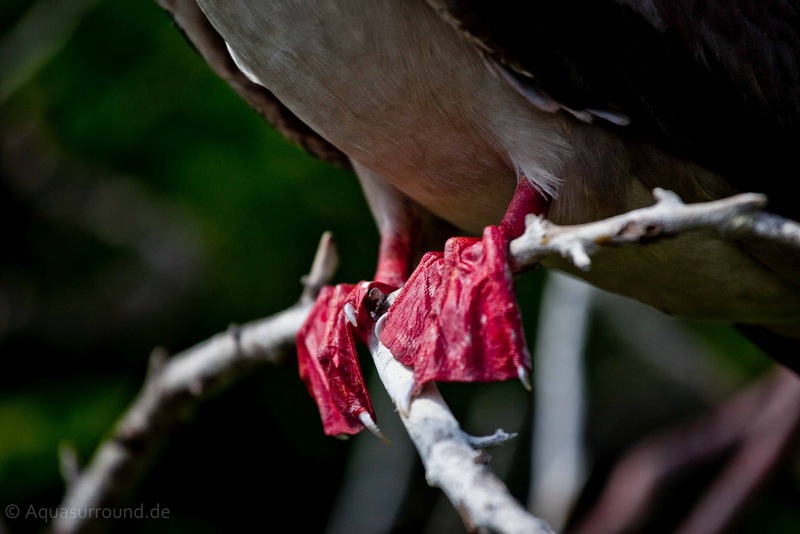 The species are distinguished by their beak styles, which translates into the way in which they forage for food and allow them all to survive by eating different kinds of plant life. The finches were the foremost catalyst for Darwin's theory on the Evolution of the Species and Survival of the Fittest. The southeastern cliffs of Genovesa also are alive with one of island's largest colonies of petrels (up to 200,000 pairs), tiny, nocturnal birds that share the small point of land with their daylight-loving relatives, the delicate band-trumped petrels. 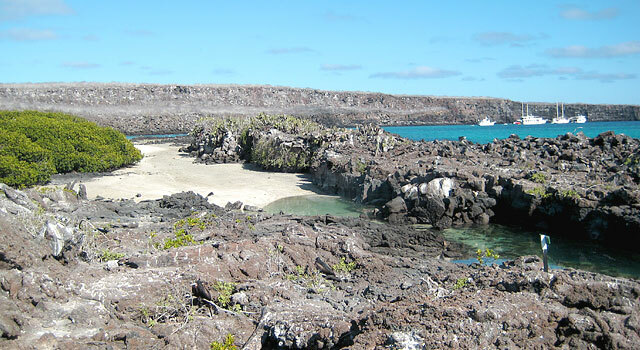 And the Galapagos dove can be seen bobbing along under bushes and over the lava, looking for seeds. Bear in mind that here you are actually snorkeling inside of a volcano – that fact alone making this a life-changing experience. You might see groupers, jacks and barracuda, eagle rays, tunas and schools of smaller fish and sometimes mantas or hammerheads. 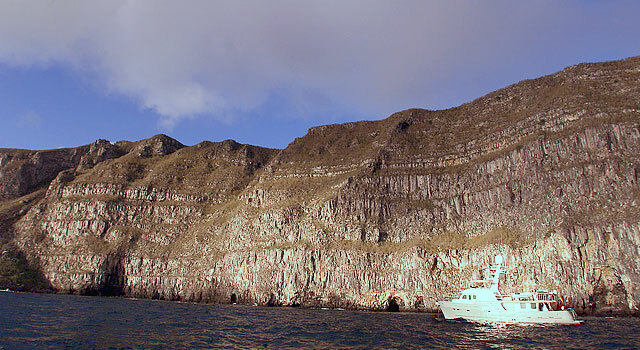 Because of the steep underwater terrain of Genovesa, snorkeling and scuba-diving can be exciting and unique from other sites in the archipelago. Snorkelers that like to dive and can hold their breath for extended periods of time may see interesting bottom-dwellers, tropical fish found only in the northern archipelago, or even a hammerhead shark. I'd love for you to read two posts by my good friend and author Cindy Procter-King about her experience on Genovesa. Cindy is a terrific writer, very humorous and since she was a guest during one of my tours, you will even learn more about me. What a combination! Please enjoy.